Ian Jewel studied at the Royal College of Music with Cecil Aronowitz and in Italy with Bruno Giuranna. He also worked with Orrea Pernel, Symon Goldberg and Max Rostal. 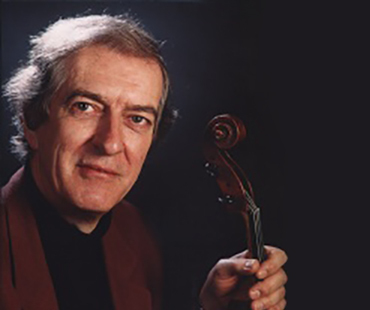 For 35 years he was well known as the viola player of the Gabrieli String Quartet, with whom he has toured the world and made over fifty recordings as well as numerous broadcasts and television appearances. Ian Jewel has also given many concerto performances, including the Walton and Rubbra Concertos, Harold in Italy by Berlioz and Mozart’s Sinfonia Concertante. He has recorded the Brahms Songs for contralto, viola and piano with Bernadette Greevy and Paul Hamburger and has played the Brahms E flat Sonata on BBC Television. His solo CD with pianist Ian Brown, was very well received. He is much in demand as a teacher of viola and chamber music and has taught at several international summer schools in France, Spain and the US. His annual summer course, “Cadenza” takes place in July at the Purcell School. He was Head of Strings at the Purcell school for 18 years. Ian’s students are well established in the music profession, the viola players in the two resident quartets, Sacconi and Cavalleri quartets, Robin Ashwell and Annie Billby were his students. In 2012 he founded the Belsize Festival, an annual Festival of Chamber Music in Belsize Park, London. In Menorca, he is involved in the “Musicale”, a biennial Festival of music.